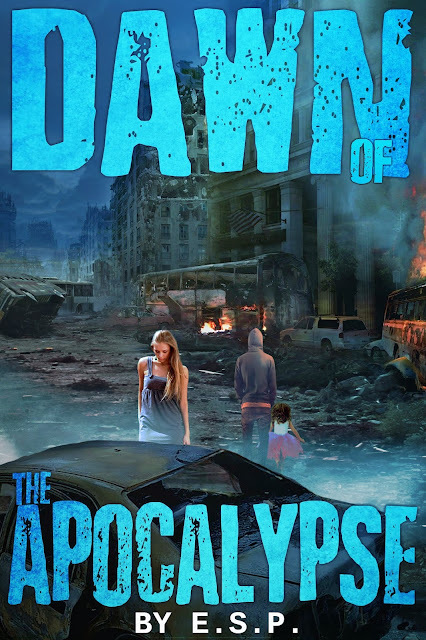 Jessabella Reads: Author Interview + Giveaway: Dawn of the Apocalypse by E.S.P. Author Interview + Giveaway: Dawn of the Apocalypse by E.S.P. Welcome to my stop on the Dawn of the Apocalypse blog tour hosted by IFB Tours. Today we have an awesome interview with the author and a tour wide giveaway! December 21, 2012These are just a few of the days humans prophesied as bringing catastrophic events that would end the world. We predicted nuclear warfare. Drastic climate change. A call from God. 1.) How did you come up with the idea for Dawn of the Apocalypse? I had a very alarming *nightmare* about gargoyles. One day I was daydreaming and decided I wanted a new book to write. Or at least try to write. I used another book idea I had and kind of combined the gargoyles into one story. My biggest inspiration has been my father. As a little girl, I watched him do his first book signings. Me, him, and my sister were even writing a book together at one time. He really encouraged me to do something with my talent. 3.) Describe your writing space. Any "must haves"? No distractions. Which is hard when working on a computer with internet connection. I find my hands wandering to check my Twitter. Or getting up to get food. If I could work in a room with all white walls, no windows or furniture, I would be set for life. 4.) Which character was your favorite to write? Cliff. Cliff had a lot of layers and a really troubled past. They sometimes would help or hurt his chances of survival. It was fun to write about someone with so much emotion, especially because I could relate to him. 5.) Which characters are you most and least like? Why? I am most like Cliff and Hunter. They are kind of similar, unfortunately they never realize it. Hunter is a little self-conscious about herself, which I can be at times. And Cliff is really family oriented but keeps to himself. That describes me in a nutshell. Fatal by T.A. Brock, Gregor the Overlander by Suzanne Collins and Rot&Ruin by Jonathan Maberry. As you can see, I'm really into fantasy/sci-fi. 7.) What are you reading right now? If nothing, what was the last book you read? I'm currently reading the Survivors by Daniel Harvell. And you can check out my blog for the review, wink-wink. 9.) What can we look for from you next? Another book. I will never stop writing, and I plan to die with at least a hundred books to my name. And if you like DAWN OF THE APOCALYPSE, there might just be a part two. If that's for certain, I will never tell. I am a dystopian junkie and who doesn't love end of the world books?? And gargoyles are the ultimately evil instead of zombies? Talk about originality. Thanks for participating in the tour! Great interview questions! I participated in the Apocalypse! blog hop a few weeks ago. I am on a dystopian kick now. Dawn of the Apocalypse sounds pretty interesting. It has gargoyles. It's a GARGOYLE INVASION! Whaa? I knew that they looked too funky to just be water spouts. How could I not want to read it? I've always loved sci-fi and/or dystopian, and this book sounds like just my kind of story. I love apocalyptic books! They often turn out to be favorites.